Look no further if you’re looking for a meaningful volunteer experience in one of the most vivid and captivating countries in Central America! Volunteer in Guatemala, and bask in the entrancing landscapes and intriguing history of Mayan and Spanish blend while contributing to society. If you’re into the Mayan history, gorgeous mountainous landscapes or one of the richest cultures in the world, you will love Guatemala. Guatemala is known as “the country of eternal spring”, famed for its captivating landscapes and breathtaking biodiversity. Its rich and distinctive culture from its long history from Spain and the native Maya people makes it a favorite destination for many travelers. With a history that includes a millennium of Mayan civilization, three centuries under the Spanish rule and a guerrilla war that spans almost four decades, Guatemala promises an exciting adventure for culture buffs. However, poverty in Guatemala is rife and deeply entrenched, with approximately 51 per cent of the population living in rural areas of the country. This is due to the extremely unequal distribution of the nation’s wealth, in which about 20 per cent of the population controls over 50 per cent of the riches. Contact us today to volunteer in Guatemala and experience the magic of the beautiful country while uplifting the lives of the people ! New Hope Volunteer programs start on the 2nd and 4th Monday of the month. New Hope Volunteers will arrange for the accommodation and meals throughout the volunteering duration in the Guatemala program. Our host families have all been carefully screened before being selected to participate in New Hope's volunteer programs. Our host families also have significant experience in accommodating international volunteers. Host families offer a safe home, private rooms (occasionally rooms will be shared with other same-gender volunteers) and shared bathroom facilities with running water and a “western” style toilet. Volunteers have the ability to do laundry at the house or the host family may offer to do it for you for a nominal extra fee. You receive three prepared meals per day. If you will be out of the house during lunch hour, you can request a lunch "to go" that you can take with you or eat out on your own. Host families provide typical meals that are traditional to Guatemala. New Hope also offers extensive support for you so that you feel right at home while volunteering. The main person supporting you throughout your program will be our country coordinator in Guatemala, who is also in-charge of your volunteer program. Whenever possible, the coordinator will call or visit you to see if you are happy and satisfied with your project. You will also have the coordinator's mobile phone number that you may call any time should an issue arise. Our project staff will also guide and help you throughout the program. You will meet the project staff daily during your volunteer work in Guetamala. 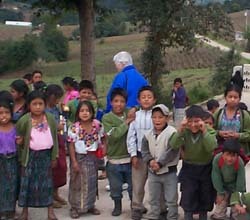 What are New Hope's programs in Guatemala? What should I do if I get delayed or miss a flight? Where do I stay during my volunteering program? What are Visa regulations in Guatemala for volunteers? How should we take care of our health while in Guatemala? What vaccinations do we need to have? Can I use a debit card or credit card? Should I bring travelers checks? How do I communicate with my family? Is there internet available? What materials do I bring during my volunteering in Guatemala? What gifts should I bring for my project and/or host family?